In 2008, Johnny FD was 27 years old and living in California, earning about $50,000 a year working in business-to-business sales. When the company he worked for was sold later that year, he was offered a choice: stick with his position, or take a stipend and be laid off. He chose to go. After spending a few months blowing through his savings with friends in Los Angeles (“I’m lucky I got out without too much debt — my friends all have $20,000 of credit-card bills they’re still trying to pay off”), he turned his sights on somewhere a little farther from home: Thailand. In his first seven days, he took seven different tours. The last one was scuba diving, and he was so thrilled with the experience that he spent the next few years going from zero dives to nearly 1,000, traveling the world teaching diving and searching for the perfect place. To get some cash and free gym time, he tried something new: Muay Thai, a fighting style practiced in Southeast Asia. “I was turning 30 and thought if I don’t try it now, I never will,” FD (the surname he uses professionally) remembers. Johnny FD / FacebookFD during a day of scuba diving with his girlfriend, Larissa, in Koh Lanta, Thailand. He had been keeping a blog about his experience with Muay Thai, and he’d heard that people could make money turning their blogs into ebooks, so he decided to give it a shot. He repackaged his blog into “12 Weeks in Thailand: The Good Life on the Cheap,” which made $600 in its first month on sale. FD stumbled across dropshipping, a business where you serve as a go-between for customers who want to order products online, like a smaller-scale Overstock or Wayfair. 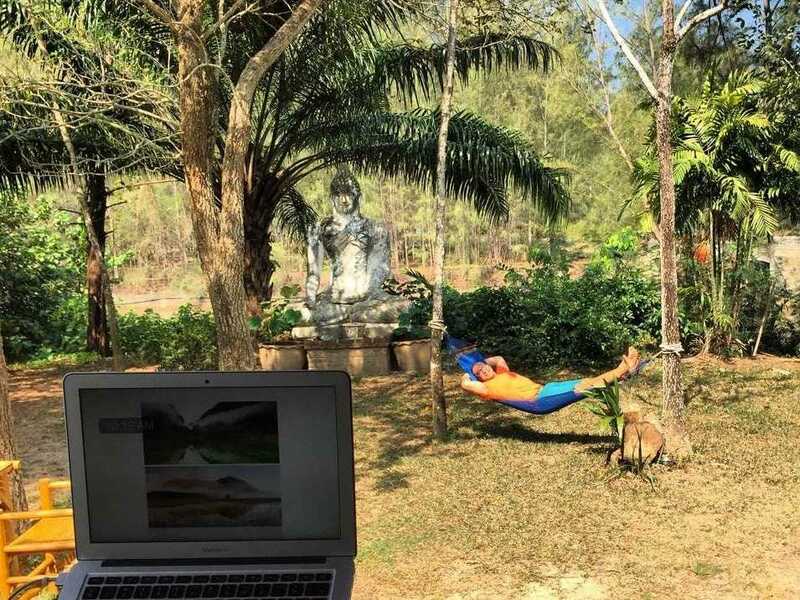 After taking a course to learn the basics, he set up a dropshipping business from Chiang Mai that became a main source of income. He explains that he runs his businesses in two modes: growth, where he puts in 40-50 hours a week to finish new projects and pursue new opportunities, and maintenance, where he spends 4-10 hours a week simply maintaining the framework he’s already established. For the last six months, he’s been in maintenance mode. Johnny FD / FacebookA day at the office for Johnny FD. Today, FD makes about $40,000 in revenue per month between various online pursuits, including his books (he wrote a second, “Life Changes Quick: 7 Steps to Getting Everything You’ve Ever Wanted,” in 2014), his dropshipping business, online courses he offers on Udemy, and miscellaneous sources such as affiliate income from his blog, JohnnyFD.com. While his income varies, he generally brings home about $10,000 a month, and details his exact earnings through monthly income reports published on his site. “If I was making this much in California, I would feel like I had to watch my budget, but here my expenses are less than $1,500 a month, which means I have $9,000 or $8,000 to save, or if I want something or to go somewhere, I really don’t think about it,” he explains. Have you walked away from a steady, high-paying job to create your own path? Write some comment. Next articleTraveller, 31, earns $1MILLION and finds a glamorous girlfriend while exploring the world in style. Don’t Let Your Personal Finances Knock You Down. Read These Tips!